Home » Economy » Government & Politics » Can China Afford To Have A Trade War? Many investors are watching the potential trade war. But they might miss another important story: China’s economy is already slowing. 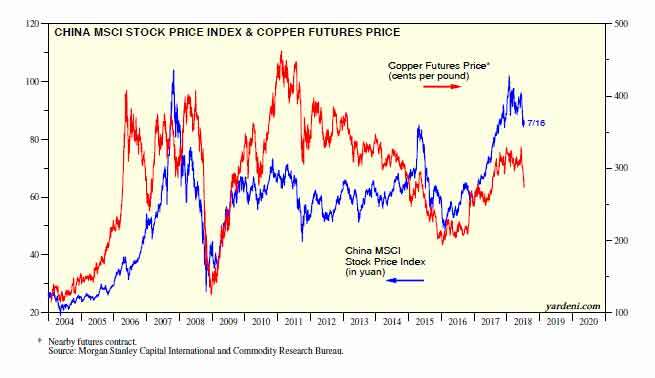 The chart below shows an index tracking Chinese stocks and the price of copper. The two almost always move in the same direction. Modern economies require copper. China needs copper for new buildings, new electrical systems, new machinery and other goods. Chinese demand in the past 20 years largely determined the price of copper. Increased demand at the turn of the century drove the metal’s price up. The deep recession in 2008 sent prices plummeting. Stimulus spending after that pushed prices to new highs. Now, China’s economy has slowed down, so the price of copper is down as well. That means this might be a bad time for China to be involved in a trade war. If China’s economy was growing, the country could survive a trade war. But with a slow economy, China needs to grow job-producing exports. Job creation has long been a primary concern of the government, a concern famously highlighted by President George W. Bush. At a meeting, Bush asked then-Chinese premier Hu Jintao: “What keeps you up at night?” Hu answered that what kept him awake was creating 25 million jobs a year to keep the economy moving forward. Can China Afford A Trade War? Job creation is still a priority in the county and will require making peace with the United States. A trade war could end with China agreeing to increase imports or fund investments in the U.S. Many face-saving solutions are available if negotiators are serious. And the data shows negotiators will be serious. China simply can’t afford a trade war. So watch for a quick resolution.